Another great spread of charts in the FT today from my near namesake Sarah O’Connor (actually my sister’s namesake), coinciding with the Prime Minister’s call on businesses to raise pay. Sarah puzzles over the apparently anomalous fact that the share of national income going to wages appears to be increasing faster than in other countries, while as everyone knows wages have been falling on almost any measure. The chart comes from the compendious International Labour Organisation (ILO) annual Global Wage Report, this year titled “Wages and Income Inequality”. Well what the Treasury reckons might well be true, but is there anything else that might explain this? I've got two suggestions. As the ILO report notes, labour income share can decline despite high real wage growth if labour productivity gains are even higher. Naturally, the opposite is also true - the labour income share can grow despite low real wage growth if labour productivity gains are even lower. 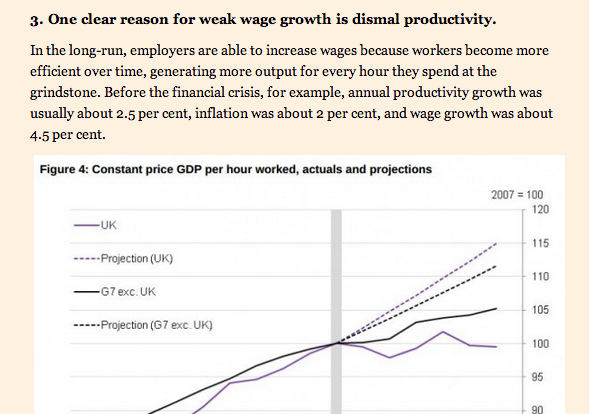 As Sarah goes on to note separately the continued weak growth in productivity in the UK (and notes the puzzle about this too), clearly there is at least the possibility of one being a possible factor in causing the other. 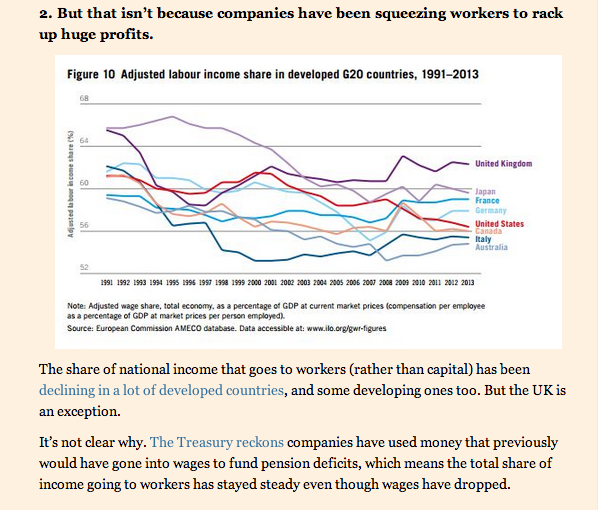 Perhaps more significant though is the reliability of the actual data on labour income share for the UK. The ILO rightly explains that income needs to take account of what self-employed people earn as well as the amount paid to employees, with particular reference to the chart used by Sarah. The footnote 15 leads you to a technical appendix in the Global Wages Report from 2010/11 which suggests two different methods for estimating self-employment income. The first of these is simply to assume that self-employed people earn the same on average as employees. The second - slightly more sophisticated is to assume that they earn the same on average as employees in the same industry sector. 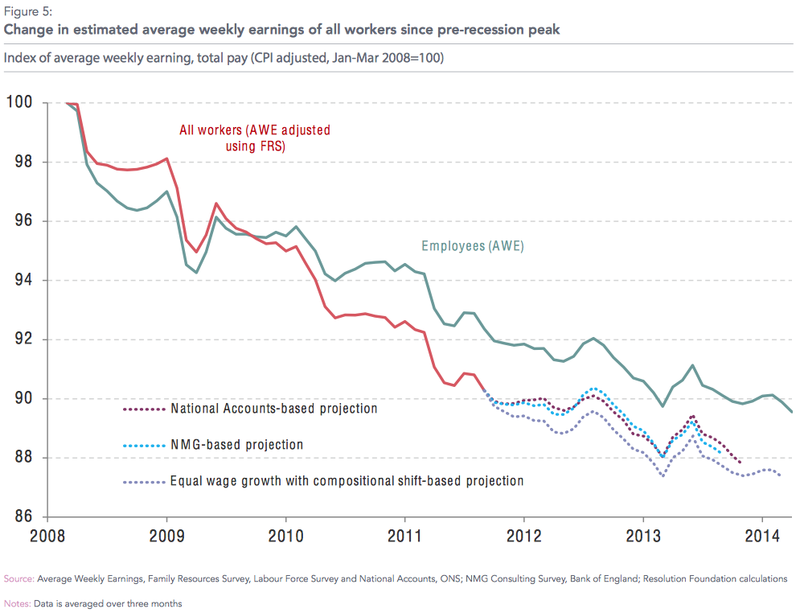 It is not entirely clear which has been used in the current report, but both methods will give for the UK a quite misleading result, the extensive work by the Resolution Foundation here showing clearly how self-employed income is lower than for employees and how it has fallen further behind in recent years. Taken together with the increasing proportion of self-employed people in the UK workforce this factor means that data presuming equivalent incomes - whether overall or by sector - will have erroneously boosted the apparent labour share of income for the UK.